We had a bit of a debate over whether this figure should get its own entry, or just be tacked on the end of the normal release. The final verdict? Got a unique name, got a unique bio... gets its own review. The smart choice wins! Yes, that's very nice and all, but it doesn't actually have anything to do with this particular figure. It's like the bio was written without ever seeing the figure the Four Horsemen had designed. Sure, eventually she became minister of defense and dealt with the forgettable villain Imperiex, but that's not this. This is quite obviously from the period where Diana was stripped of her role as ambassador to man's world and Artemis won the contest to succeed her. The stuff in her bio happened much later, and shouldn't even get a mention. Imagine if the bio for Classic Detective Batman were all about Bane breaking his back, or his "death" in Final Crisis. Same situation. The reason we can say this Artemis unequivocably represents the time she filled in as Wonder Woman is that in this series, she's filling in for Wonder Woman. 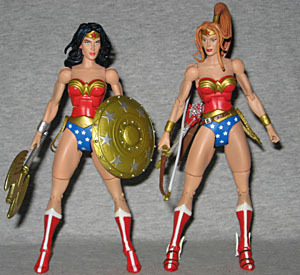 Every figure in DC Universe Series 4 (except Ares) had a variant to be found, and Artemis is Wonder Woman's. That means the majority of her action figure is the same as the Wonder Woman version, so for all the finer details of that (and in a shameless attempt to boost our own stats), we'll just provide a link over to Artemis' DCU4 Wonder Woman review. That's "Artemis" the reviewer, not "Artemis" the character. You can see why we traded off. This review will focus on the differences, not the sames. The most obvious difference, of course, is the head. Or precisely, the hair - the face is different, but it's not that different. Artemis and Diana are both attractive women, so there's no real separation, there. I would have liked to see a bit more of a Middle Eastern look, since that's where Artemis' ancestors have been breeding for the last few thousand years, but that's not how she was drawn in the comics. She does have some nice personality showing through in the sculpt, however. She looks sassy. Arty's red hair is pulled into a long ponytail rising from her crown (as opposed to the nape of her neck), and quite a mess of loose strands spill around her face. The ponytail itself is long enough to reach her belt girdle, and twists a bit around its own axis, but what really impresses me is the sculpting of the hair being pulled into the ponytail: there are gaps in it, just like real women get when they pull their hair back. That's a truly lovely bit of work, a very subtle element that not a lot of people would have even thought of, let alone had the skill to pull off. Four Horsemen! The Bana-Mighdall Amazons don't have the powers (or the immortality, for that matter) of the Themyscirian Amazons, so Artemis resorted to using performance-enhancing gear: the Gauntlet of Atlas and the Sandals of Hermes. The gauntlet increases the wear's strength by a factor of ten, while the sandals provide speed. 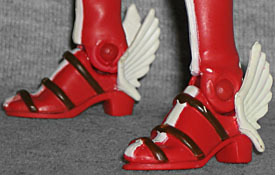 To represent these, the figure gets different feet than Wonder Woman did, with the straps of the sandals running over her boots, and the wings on her ankles. She doesn't get new forearms, though, so she's wearing the same featureless bracelets as Diana - but to set them apart, hers are painted gold, rather than silver. 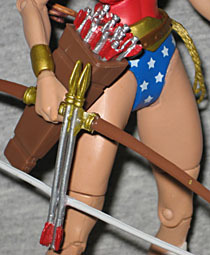 While Wonder Woman had a shield and axe, Artemis is armed only with a bow (and the golden lasso, which is still permanently attached to the figure - it's just on her left hip instead of her right). The bow is fairly nice, though it's a bit strange that it's been moled with two arrows on it. And not even properly nocked, just floating there. It's weird, but it's not ugly. She's also got a quiver of arrows slung around her waist, and between that and the placement of the lasso, it seems Artemis is left-handed. The articulation is, let's face it, insufficient. While we could excuse the lack of double-elbows and knees on Wonder Woman, it's not as easy here: Diana is a brawler, one to stand her ground in a fight and just beat on her enemy until he drops - just look at her absolutely brutal fight with Genocide in the recent "Rise of the Olympian" storyline. So she's not as poseable as she should be? That's okay, she's just going to punch things anyway. Artemis has an entirely different fighting style, one based less on direct confrontation. Diana is George Foreman, Artemis is Muhammad Ali. For a really adequate Artemis figure, she'd need as much articulation as, say, Shocker Toys' Indie Spotlight figures, with balljoints in the trunk, double joints in the mid-limbs, and better rocker ankles. You ever seen the kind of crazy acrobatics Spetsnaz will do in a gunfight? I want to get Artemis into some of those poses, aiming her bow at whoever's unlucky enough to be in her sights. Maybe Despero, since she comes with his right leg. 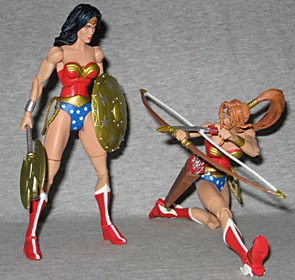 The main problem with Artemis, the crippling flaw in her very conception, is her position as the Wonder Woman variant. 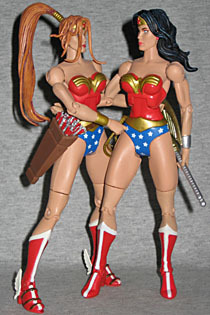 Unlike Sinestro (or even the blink-and-you'll-miss-it-never-see-it-again Superman Red/Superman Blue), Artemis isn't shipped in equal numbers with her sister. The distribution and ratios are embarrassingly out of whack: a few areas got flooded with Artemis, while in most she never surfaced at all. DCU Series 4 came out in October, and here it is June (eight bloody months later) and I've yet to see a single Artemis in any store anywhere. You wouldn't even be reading this review now if not for the benevolence of one of our readers. To add insult to injury, Mattel has shipped cases of DCU7 that include a "best of" assortment, including the plain Wonder Woman... WHEN YOU CAN STILL GET THE ORIGINAL RELEASE OF THAT FIGURE EASILY! She's still in stores everywhere, and Mattel did a re-release?! It's so stupid! You know, when we say Mattel is completely out of touch with what actually goes on in the market, we're usually engaging in hyperbole - in this case, you start to think there's some literal truth to the idea. Artemis isn't a great idea for a variant. We always perfer an alternate costume over a completely different character, but look at it this way: by making Arty Diana's variant, they get this costume out of the way now, and they can still do a standalone Artemis (in her own costume) in a later series. Final estimation? She's not spectacular, but she's okay. If you happen to live in one of the areas where you actually stand a chance of finding her, then sure, go for it. Then you can decree whether Artemis or Diana deserves to be the one true Wonder Woman.